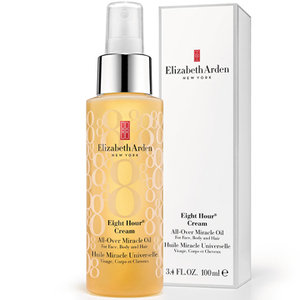 Perk up and protect lifeless skin with the Elizabeth Arden Eight Hour Miracle Mist Set; a selection of cult-favourite skincare treats to intensively hydrate and nourish. Utilising the brand’s renowned Eight Hour® formulations for long term benefits, the moisturiser, facial oil and mist work in tandem to impart a fresh and replenished complexion. Instantly refresh and revitalise with the Miracle Hydrating Mist; an ultra-refined facial spray powered by Elizabeth Arden’s exclusive superfruit blend, brimming with antioxidants and vitamins. Acai, Goji and Pomegranate to name just a few, alongside Apple Leaf extracts, combat free radical damage and help alleviate discomfort, leaving your complexion feeling soothed and supple. Perfect for on-the-go hydration. A multi-tasking oil for the face, body and hair. Enriched with hydrating Tsubaki Oil, the versatile oil delivers long-lasting moisture, melting effortlessly into skin and hair to soften, nourish and brighten. 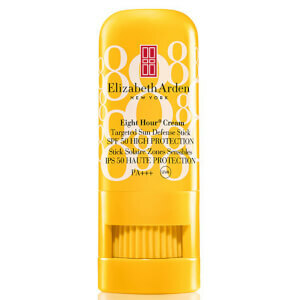 It intensely conditions hair, smoothing frizz and flyaways to promote sleek, healthy-looking locks. On skin, it deeply hydrates and is the perfect massage oil. Hair is left shiny and sleek; skin is radiant and supple. Liked it! Really good kit for a body. Only ''Cream Original Skin Protectant'' smells terrible. I've bought this because I was looking for a good hydration mist for my extremely dry skin. I've been using for the past days and I can say that my skin is substantially better. Still a bit dry, but I expect it to become better and better over time. This price is great for the set. The oil is also quite nice and soft and my makeup doesn't look cakey anymore. Perhaps I will try the anti-aging or other treatment lines of this brand as well. I believe these 3 are essential must-haves for anyone!